Caren first laid hands on a guitar when she was 10 years old; and she started teaching just three years later when she was 13. Since then, she has taught literally hundreds of people how to play and continues to be in high demand as a teacher, mentor, and performer. Caren is an acoustic guitar slinging singer/songwriter, and specializes in all manner of lessons in that area on Guitar Tricks. While she is often recognized for her precisely decorated fingerpicking style, Caren also loves to kick a good groove to back her soaring vocals. Caren currently resides in the SF Bay Area, and has produced her own albums, won many awards, and continues to teach guitar. Caren will show you a beginners approach to this pop rock classic with simplified, whole note strum and an easy set of chords to play along with the band. In this set of lessons, Caren Armstrong will teach the holiday song "All I Want For Christmas Is My Two Front Teeth". Caren will introduce the song and talk about gear and tone, then teach the song intro. The verse part is next, then we're on to the bridge; we'll learn the bass run after that. Caren will show the strumming and song form before walking you through it all slowly, then we'll do a play along performance. Caren will show you all the parts to both interweaving finger picked acoustic guitar parts in this song. Travis picking will be used! In this set of lessons, Caren Armstrong will teach "Blackbird", as made famous by The Beatles. Caren will talk about the song and the acoustic tone before detailing the song intro; then she'll get into the 1st verse and turnaround. Next up is verse 2, then the bridge; then the solo verse. We'll learn the breakdown section and the 2nd turnaround, then the last verse and the ending before we end with a play along performance and a jam along. Caren will show you how to fit the acoustic guitar sound fitting in beautifully with a big rock and roll production. With it's walking bass and big, fat guitar tone it really carries the song even while surrounded with bass, drums, and electric guitars. Caren will show you how to strum an acoustic guitar part along with this classic pop tune. In this song tutorial, Caren Armstrong will teach "Foolish Games", as made famous by Jewel. We'll start with a song introduction and the gear and tone, then break down the chords and finger picking in the intro for you. Then we're on to the verse and the pre-chorus, leading us to the chorus parts. We'll learn the transition to the outro and the outro before we do a play along performance and a jam along. Caren will show you the acoustic guitar part in this song that uses open chords as well as barre chords with an upbeat, shuffled strumming pattern. In this tutorial, Caren Armstrong will teach a campfire version of "Don't It Make My Brown Eyes Blue", as made famous by Crystal Gayle. Caren will introduce the song then look at the acoustic tones before talking about the rhythm and strumming. The breakdowns of the intro and 1st two verses are next, then we'll learn the bridge before we go to verse 3. We'll learn the song ending, then the theme melody; we'll end with a play along. In this set of holiday song lessons, Caren Armstrong will teach "Frosty the Snowman", as made famous by Gene Autry. Caren will talk about the song and the gear & tone; then define the song form and teach the boom-chick strumming. We'll learn the song intro before we look at the verse and bridge parts, then learn the outro. We'll break down the walk-up bass run, then do a play along performance. Caren will show you this classic singer-songwriter tune with a great fingerpicking pattern & an easy chord progression. This is bare bones, old school folk music; vocals & fingerpicked acoustic guitar. Very simple, mournful & world weary. Caren will show you all the acoustic guitar strumming parts that make this song a fun one to play! In this tutorial you'll be learning the main, strummed acoustic guitar. Caren Armstong here at Guitar Tricks teaching you how to play "Hey Jude", as made famous by The Beatles. This is a serious workout for the left hand, and an excellent song for students looking to up their bar chord strength. The song features a simple I IV V structure with one sneaky bVII on the outro. Even though the song starts with a simple arrangement of I - IV - V chords, it is made great by an effective vocal and melody line and a lot of dynamic changes and adding of layers as the song progresses until it hits that final epic ending! Caren will show you the 4 chords of the song along with the Boom Chuck/chick strumming pattern that make this song fly down the tracks! Caren will show you the delicate guitar part to this beautiful ballad. There are many great acoustic fingerpicking tricks and techniques to be learned: descending basslines, inversions, ritardando, accompaniment playing. Caren will show you an acoustic guitar part arranged to play along with this classic tune. She'll show you the basic chord progressions, the finger picking pattern and a bonus lesson on how to mimic the famous piano motif. In this set of lessons, Caren Armstrong will teach you "Keep on Truckin'", as made famous by Hot Tuna. We'll introduce the song and talk a bit about gear and tone, then look at the chord progression. Travis picking is up next, then we'll combine the two. After that we'll take a look at some variations, then learn the song ending. You'll learn a bonus riff before we do a play along performance and a jam along. In this series of holiday lessons, Caren Armstrong will teach the holiday standard "Merry Christmas, Baby". After a song introduction and a peek at gear and tone, Caren will look at the big picture with the timing, the chords, and the song form. Then we'll look at the song sections; the intro, the verses, the solo, the bridge, then the outro. We'll finish with a play along performance. Caren will show you how to play along with the classic repertoire builder. It's been covered by everyone from the local band at the corner coffee shop, to The Beatles. This song is easy to learn and fun to play. You'll have everyone dancing and singing along in no time! This series of lessons will be on the song "Shambala", by Three Dog Night. Caren Armstrong will teach this one, starting with an introduction to the song and a brief look at the gear and tone. The following lessons will examine the chords used, the song form, and the rhythm and strumming; then Caren will teach the A, B, and C sections of the song. You'll do a play along performance with Caren before you take over and play the song by yourself. Caren will show you this classic, which is old school country music at it's best, with lots of pedal steel and back ground vocals to sweeten things up. Take that away and you have the rhythm guitar part that carries the core of the song. Caren will show you the guitar parts in this singer songwriter hit. The original version of this song has several acoustic guitar fingerpicking layers. We’ve made a composite version to make it easier to teach, learn & perform with just one guitar. This arrangement is based on a solo guitar performance, but we’ll also include the backing band from the original version. Caren will show you the chords, the boom-chuck technique and the alternating bass motion used to play the acoustic guitar part to this classic country tune. Caren will show you the Travis picking used throughout this acoustic song. We will be playing in "Drop D" tuning for this song. Caren will show you how to play this Motown sing along classic song with a few simple chords and an easy swinging strumming groove. Caren will show you lovely song that has some some fun challenges for acoustic guitar strumming. Caren will show you how to play this great song on acoustic guitar using simple chords with a cool groove and great lyrics. Caren will show you all the parts of this uptempo country classic played on acoustic guitar featuring some boom-chick strumming and modulations. Caren Armstrong teaches a folk song on acoustic guitar that every beginner can learn! "Where Have All The Flowers Gone" was originally made famous by Peter, Paul and Mary. In this tutorial, Caren Armstrong will teach "Who Will Save Your Soul', as made famous by Jewel. After a song introduction and a brief look at the acoustic tone, Caren will go over the chords used in the song. Next up is the right hand picking, and the song form. We'll learn the song intro part next, then the verse and chorus sections; the "breakdown" follows that, then the ending. We conclude with a play along performance then a jam along. In this set of lessons, Caren Armstrong will teach "Yesterday," as made famous by The Beatles. After a song overview and a peek at the gear and tone, Caren will lay out the song intro. Following that, she'll detail the verse chords and strumming, then go over the bridge. The song's ending comes next, and then we'll look at the song's form and do a play along. We'll cap it off with a jam along. Caren will show you an acoustic guitar accompaniment to the soulful pop classic, "You Send Me" originally made famous by the legendary Sam Cooke. A dreamy love song with a simple chord progression, a swinging beat & catchy lyrics. This song uses basic guitar chords, is easy strum along with, and fun to sing. Caren will show you how to use an acoustic guitar to play along with the band in this made easy version of a classic song. Caren will show how to play a Made Easy version of this song in order to strum the chords along with the band. This is a fun song that presents several challenges. We'll use numerous root position open & barre chords. Caren will show you how to strum an easy guitar part along with this classic blues tune. She will show you the three chords required to play along with the tune. This is required material for just about any blues jam, and in this tutorial we’ll learn an easy acoustic guitar part to strum along with the band! 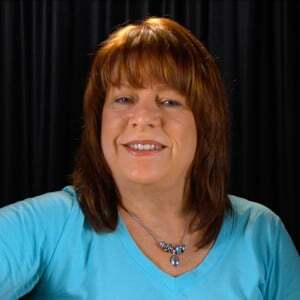 Caren will be teaching you a classic 70s radio rock song, Lucky Man by ELP, a prog rock band. In this tutorial we’ll learn a simple beginner approach to play along with the band. There are both acoustic & electric guitar layers in original version. But at the core this song is a strong vocal melody backed by a strummed acoustic guitar! Caren will show you how Creedence Clearwater Revival created a sound that blurs the lines of genre and a song that appeals to virtually every music lover. This essence of this song is 3 easy chords and a shuffled strum. It also includes one barre chord, B minor, just to keep things harmonically interesting. If you're new to barre chords, here's your chance to get started! We'll also be taking a look at the signature intro riff, which features a few more chords and some fun rhythmic challenges. Caren will show you how to play along with this great swinging pop rock song that has a great bluesy beat, a little country style strumming and a fun chord progression that ties the whole thing together. Caren will show you an easy arrangement on the acoustic guitar that we can play throughout the song! Using mostly open chords and an easy swinging strumming rhythm you can play along with the band on this classic tune. Caren will show you how to play a made easy version of this song that teaches you all the chords and parts to play along with the band on this iconic tune. In these seven guitar lessons, Caren Armstrong will teach you how to turn barre chords into jazz chords. After introducing you to the tutorial, Caren will first break down the A7 chord, and in the next lesson, the E7 chord. Then it's time to learn to shift between the chords. After that, we'll look at harmonic reationships in A and E, playing progressions that use the I-IV-V chords. Last, Caren will demo some examples with different feels. Caren Armstrong's Guitar Tricks Channel debut goes back to the basics. You'll see why Caren is a beginner's favorite teacher, with fantastic descriptions like "third finger first" of just what you need to do to break through the toughest beginning guitar roadblocks. Here are four separate free lessons by Caren Armstrong. Caren will show you to take the basic Travis picking skills learned in an earlier tutorial and play a more advanced version of this this acoustic guitar style technique.